A criticism of Left Renewal, a libertarian socialist tendency within the NSW Greens in Australia. It is additionally recognised that any critical observations regarding Left Renewal’s political programme will always be misconstrued by members because of the contradictions inherent in its ideological statements. Left Renewal views the State’s authority as illegitimate, but it also wants to legislate a Universal Basic Income? At community forums, Left Renewal members favourably recount the era of the neo-syndicalist NSW Builders and Labourers’ Federation and the Green Bans, while concurrently advocating for the Leninist model of intervening within the reactionary trade unions? Does Left Renewal want to destroy capitalism, or does it simply want to raise taxes on the rich and institute a maximum income policy? Democratic socialist, state-ownership of industry (even within an ‘interim period’), or communal, decentralised self-management of production? These contradictions make any possible critique from fellow comrades, however supportive, challenging to direct. Left Renewal has successfully wedged the Australian Greens leadership on issues like nationalism, colonialism and police powers. The tendency has also stuck it to liberal tree tories like Richard Di Natale, Bob Brown and Christine Milne, who want to rudder the party’s direction towards the centre. At the same time, Left Renewal’s views on the State, bureaucratic trade unions and the effectivity of varying modes of resistance are at best unclear, and at worst problematic. Left Renewal represents the repressive desublimation of NGO admin, ACTU-affiliated union organisers, University of Sydney student politics milieu, former federal candidates and MP staffers to express their ideological desires for revolution, but within a domesticated, process-based online arena. The mainly libertarian socialist tendency provides a space to posture as rank-and-file party members, despite the Left of the party having already maintained administrative power within the NSW Greens since its inception. The Sydney Greens, from its founding document in 1984 (p. 5), proposed the Greens as a big tent, Left coalition sprouting from the recesses of the New Left. The Sydney Greens project was an attempt to exercise electoral power outside of the accelerating twilight of political militancy inside the Labor Party’s Leichhardt Municipality. In many ways, the Sydney Greens was the result of disillusioned Labor Left activists like Hall Greenland and Tony Harris desiring their own ‘left renewal.’ Thus, in the wilderness following ALP Prime Minister Gough Whitlam’s 1975 dismissal and rejected from the Labor Party’s anti-Communist Catholic Right, the Sydney Greens was formulated (Harris 2002, p. 280-281). Left Renewal has little to do with the lukewarm social democracy of Bernie Sanders or Jeremy Corbyn, despite making emphatic appeals to their bases. Conversely, it is much closer (ideologically) to the direct democracy projects of Spain’s Podemos or the early German Greens. All these attempts though, when pushed to the end of their dialectical logics, disintegrate due to internal party backstabbing or the loan sharks of international finance. Maurice Brinton of the UK libertarian socialist group Solidarity (no, not Cliffite Solidarity) suggested that radical folks with genuine intentions in these types of parties had been conditioned by the myths of capital. In the 1972 pamphlet As We Don’t See It, Brinton stated that building a “non-manipulative society cannot be achieved by manipulative means or a classless society through hierarchical structures” and that any serious attempt in doing so “will doubtless be dismissed as ‘intellectual theorizing’ by every ‘voluntarist’ or ‘activist' tendency, eager for short cuts to the promised land and more concerned with movement than with direction.” Essentially, to begin to break apart the social superstructure hovering above, wins have to be made by the multitude* at the material base. In clarifying that point, just look at the example set by the beloved NSW Builders Labourers’ Federation and the green bans it imposed, sanctioning developers’ interests in support of park lands, public housing residents, Aboriginals, LGBTQI+ people, and prisoners. The green bans only started coming in droves after the success of the 1970 margins strike and use of direct action during that strike, such as the destruction of private property. When the white, male construction workers of 1970s Sydney realised their power collectively as a class, they had started to breakdown their alienation from labour. Hence following the breakdown of alienation also came the breakdown of self-ostracisation from other, more oppressed segments of capital’s surplus population, like women, homosexuals and Aboriginals, that the ruling class had taught them to hate (Burgmann & Burgmann 1998, p. 120, 124). Contrastingly, Left Renewal’s praxis suggests that by catering abstract political appeals to regional NSW and Western Sydney that they will get the class onside. Contra the 1980s Sydney Greens developing out of militant extra-parliamentarianism, Left Renewal is a burn book that has developed from internal electoral failures, the defiance of party processes by the NSW Greens Right and negative interpersonal relationships with Greens MLC Jeremy Buckingham and his cabal of staffers. With meetings born out of reaction to Buckingham and co.’s pragmatic, small business-friendly vision for the Greens NSW, little time has been spent formulating community campaigns to build for direct actions, discussion instead syphoned into report backs from bureaucratic bodies Left Renewal attempts to influence. Sydney Greens’ firebrand co-founder Hall Greenland (2017) noted in his supportive critique of Left Renewal that it is “a little too conservative” because of its provision for binding members to caucus decisions, which could dismantle local group autonomy. Murray Bookchin’s vision of confederalism echoes Greenland’s playful criticism. Confederalism concentrated on getting anarchists to participate in local politics and forge new municipal institutions such as neighbourhood assemblies, town meetings and community councils. Bookchin argued these new institutions could network together on a confederated basis and be repurposed in counterposing the State. A dismissal of the national, top-down channels of power was specifically asserted by Bookchin (1985 & 1990). Left Renewal’s challenge is to the national and state bodies of the Greens, wedging the party on national issues rather than the immediate concerns of shared localities; it’s why the NSW Greens started with such a strong local group structure in its founding constitution (Greens NSW 1993). By engaging in local groups on the basis of trying to control the bureaucracy, rather than the initial model of utilising local groups to forge activist hubs, Left Renewal has contradicted Bookchin’s most vital contributions in drafting a radical greens politics that speaks to our lived realities. Alternatively, the South Brisbane Greens and the election of rapper, poet and Chomskyite-Graeberian, Jonathan Sri, to the Gabba Ward Council has pointed to a much greater resemblance with the Greenland-Bookchin model. Councillor Sri and their team have opened up the parameters of grassroots, directly democratic decision-making in Brisbane’s local politics. Through the lens of a ‘right to the city’ campaign, Sri’s election has opened up an alternative public sphere in South Brisbane for participatory budgeting, public transport and community-managed housing against the narrow interests of private developers and the Queensland state government (Jonathan Sri 2017). Co-founder of Right to the City Brisbane and lecturer at Griffith School of Environment, Dr. Natalie Osbourne, observed that South Brisbane’s right to the city campaign has manifested itself as a spatial politics, which also means it must be material. The right to the city campaign can consequently provide the fundamental link between the multitude’s embodied physical experiences of exploitation and alienation, and the structures of capital and the State which engender these experiences (Living the Dream whilst fighting for your #righttothecity 2017). It is the construction of this spatio-material link that is sorely missing from the strategy of Left Renewal. The staffer cliques of Left Renewal participate within social movements by physically constituting the Greens delegations to legislatively-constrained, A-B rallies. These static marches are usually centred around demanding the closure of offshore detention centres on Manus Island and Nauru, or legalising marriage equality. The content of these rallies is usually geared towards addressing the post-material, moralist concerns of progressive cosmopolitans in Sydney. These alienated forms of resistance are often organised by the Cliffite** groups Solidarity (mainly refugees) and Socialist Alternative (mainly marriage equality). The attendance of such rallies fluctuates depending on the density of clickbait liberal media coverage of the social issue at hand. The effectivity of the Cliffite marches regularly fails to deliver structural changes; this is since the Cliffites excise the radical elements of mass mobilisations characteristic of the New Left era that actually secured material gains in the 1970s — occupations of public space, direct actions, mutinies, sabotage and strikes. Rather, such diluted attempts at mass action tend to repeat the trappings of the 2003 anti-Iraq War marches where tens of millions marched and direct action was neglected (Aufheben 2004). While Left Renewal ideologically identifies with libertarian socialism, its praxis is indebted to the guidance of Cliffite interventionism into moralistic social movements. 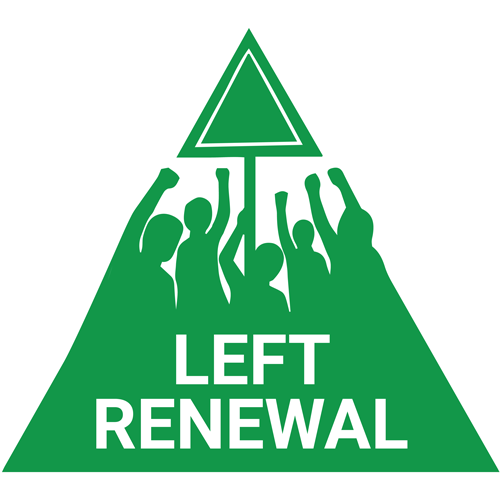 Aside from the participation of Greens delegations in rigid, Cliffite rallies, much of the practical energy of Left Renewal members is devoted to maintaining the administrative control of the NSW Greens. The maintenance of this hegemony is marshalled through by stacking the floor at the bimonthly States Delegates Council meetings, stacking out specific issue Working Groups, running democratic socialist candidates within internal MLC preselections, running for officer bearer positions within both the NSW Young Greens and Australian Young Greens and rapaciously denouncing the NSW Greens Right on internal Facebook discussion pages. What this strategy (or absence of strategy) leaves is a core of activists with little to no organisational capacity to engage with social movements outside of the NSW Greens circle of influence, let alone engage with any potential contestations with capital within Sydney, let alone outside of metropolitan Sydney and across regional Australia. The time spent guarding and solidifying administrative power is time spent undermining the project itself. A common justification for the existence of Left Renewal – that it is worthwhile intervening in parliamentary politics if resources and energy can be successfully redirected to grassroots campaigns — is left unfulfilled, the group unable to see its statement of principles brought to life materially. The combination of seamlessly ongoing administrative work needing to be done, and growing apathy towards the project, is the result of Left Renewal’s relation to process within the NSW Greens more broadly. Almost without horizons, process must be followed regarding membership, regarding contact with the media, regarding maintaining the group’s social media presence. Following process and encouraging members to participate in decision making occupies the bulk of the group’s day-to-day activity, with little often being achieved. It is no surprise that decision making becomes onerous with few willing to take part when it often only deals with wading through organising more process, such as deciding which working groups to stack. The interventions within working groups often just lead to introducing new layers of processual bureaucracy. Debating the minutiae of this process, nearly constantly, prevents members from developing any praxis that will abolish the present state of things. The centrality of bureaucratic processes inherent in the tendency’s structure turns well-meaning, revolutionary ideologues from anarchist and left communist backgrounds into democratic socialists and Cliffites in practice. Left Renewal’s praxis is a pseudo-vanguardist one, tacitly signalling that if enough disruptions are made in the political hegemony, the class consciousness of the masses will rise up with the vanguard. Of course, the State will co-opt any rising discontent within the multitude, but will make rapid developments in the forces of the economic base to boot. The ideological chauvinism of the Left doesn’t compare to the power intrinsic to the material forces of labour. The practice of democratic socialism, even when applied as an interim measure, before the ‘withering of the State’, doesn’t add up. The State is not benevolent and doesn’t cede power by it’s own volition; therefore Left Renewal must seek to avoid the contradictions of the German Greens in their approach to parliamentary politics. Communism is the movement to abolish the present state of things and such a movement cannot be instituted from above by the cosmopolitan leftists that occupy the spheres of NGOs, bureaucratic trade unions and MPs offices that are isolated from their communities — such a movement can only come from the class. The notions of the vanguard, even when cloaked with the lexicon of libertarian socialism, will trigger the separation of the revolutionary organisations from the class it attempts to struggle alongside. The Left needs to dismantle the old hegemonies indebted to democratic socialism and Cliffism (a common ideological cocktail in the wake of popular publications like Jacobin) and to demystify the discourse surrounding a new societal vision by instead focusing on the practical struggles of the everyday. * = what is intended by the term multitude; “There is no longer a clear division but rather a large gray area in which all workers hover precariously between employment and unemployment. Second there is no "reserve" in the sense that no labor power is outside the process of social production. The poor, the unemployed, and the underemployed in our societies are in fact active in social production even when they do not have a waged position” (Hardt & Negri 2005, p. 131). ** = followers, affiliates and offshoots of Tony Cliff's Socialist Workers Party in the UK, which crafted a student-based, liberal incarnation of Trotskyism. Deemed by Selma James in the introduction of The Power of Women and the Subversion of the Community as ‘modern Trotskyist liberalism’. Aufheben 2004, ‘A phenomenal anti-war movement?’, Aufheben, no. 12, https://libcom.org/library/anti-capitalist-aufheben-10. Biehl, J 1993, ‘From Movement to Parliamentary Party: Notes on Several European Green Movements’, Democracy and Nature, 1 January, viewed 18 February 2017, http://www.democracynature.org/vol1/biehl_movement.htm#_edn10. Bookchin, M 1985, ‘Radicalizing Democracy’, Anarchy Archives, viewed 18 February 2017, http://dwardmac.pitzer.edu/Anarchist_Archives/bookchin/raddemocracy.html. Bookchin, M 1990, ‘The Meaning of Confederalism’, Green Perspectives, no. 20, viewed 20 February 2017, http://dwardmac.pitzer.edu/anarchist_archives/bookchin/gp/perspectives20.html. Brinton, M 1972, As We Don’t See It, marxists.org, viewed 22 February 2017, https://www.marxists.org/archive/brinton/1972/as-we-dont-see-it.htm. Brinton, M 1975, The Irrational in Politics, marxists.org, viewed 22 February 2017, https://www.marxists.org/archive/brinton/1970/irrational-politics.htm#h2. Burgmann, M & Burgmann, V 1998, Green Bans, Red Union: Environmental activism and the New South Wales Builders Labourers’ Federation, University of New South Wales Press, Sydney. Debord, G 1967, The Society of the Spectacle, marxists.org, viewed 20 February 2017, https://www.marxists.org/reference/archive/debord/society.htm. Greenland, H 2017, ‘The Greens — a house of many mansions’, Watermelon Papers, 12 January, viewed 16 February 2017, https://watermelongreenland.wordpress.com/2017/01/12/the-greens-a-house-of-many-mansions/. Greens NSW 1993, Greens NSW Constitution, viewed 20 February 2017, https://nsw.greens.org.au/structure-constitution. Hardt, M & Negri, A 2005, Multitude: War and Democracy in the Age of Empire, Hamish Hamilton, London. Harris, T 2002, ‘Basket Weavers and True Believers: The Middle Class Left and the ALP Leichhardt Municipality c. 1970-1990’, PhD thesis, University of New South Wales. Key Issues | Jonathan Sri 2017, Jonathan Sri, Brisbane, viewed 22 February 2017, http://jonathansri.com/issues/. Living the Dream whilst fighting for your #righttothecity 2017, audio podcast, PodBean, Brisbane, 17 February, accessed 22 February 2017, https://www.podbean.com/media/share/pb-fxjgf-67c98c. Milburn, K 2015, ‘On Social Strikes and Directional Demands’, Plan C, 7 May, viewed 16 February 2017, http://www.weareplanc.org/blog/on-social-strikes-and-directional-demands/. Organisation des Jeunes Travailleurs Révolutionnaires 1972, Militancy: highest stage of alienation, libcom.org, viewed 20 February 2017, https://libcom.org/library/militancy-ojtr. Sydney Greens 1984, More Good Oil: Draft Election Platform, viewed 20 February 2017, http://lee-rhiannon.greensmps.org.au/sites/default/files/thegreensanniversary-lowres.pdf. Tronti, M 2010, ‘Workerism and Politics’, Historical Materialism, no. 18, p. 186-189. The centrality of bureaucratic processes inherent in the tendency’s structure turns well-meaning, revolutionary ideologues from anarchist and left communist backgrounds into democratic socialists and Cliffites in practice. This is an interesting article, especially as people get disillusioned by the major parties and some gravitate towards Green parties as an alternative where radical alternatives are less easy to find, as well as projects like the DSA and Momentum in the US and UK respectively. Alternatively, the South Brisbane Greens and the election of rapper, poet and Chomskyite-Graeberian, Jonathan Sri, to the Gabba Ward Council has pointed to a much greater resemblance with the Greenland-Bookchin model. Councillor Sri and their team have opened up the parameters of grassroots, directly democratic decision-making in Brisbane’s local politics. Through the lens of a ‘right to the city’ campaign, Sri’s election has opened up an alternative public sphere in South Brisbane for participatory budgeting, public transport and community-managed housing against the narrow interests of private developers and the Queensland state government (Jonathan Sri 2017). While I like Bookchin on a lot of things, the municipal libertarianism I can't really separate it from a more general municipal socialism which had serious problems in the UK with projects like Militant. It's a different electoral strategy to UK Labour/Momentum or apparently Left Renewal, but still fundamentally an electoral one with many (or sometimes more) of the same constraints. I would probably agree with this critique of 'Left Renewal' and Green Party politics more generally if I wasn't so put off by the author's uncritically swallowing and regurgitating a 'mashed-up' 'ultra-left dictionary' of language in their attempt to explain it.